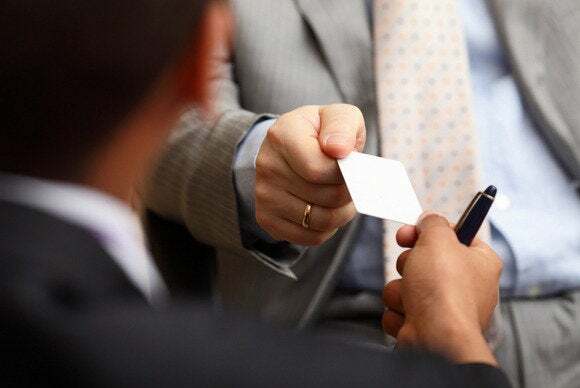 We may be edging toward a paperless world, but business cards are still the coin of the networking realm. At any given time, you likely have several sticking out of your wallet, spilling from your pockets, and stacked on your desk—everywhere but on your smartphone in your contact list, where you need them most. Fortunately, there’s a range of tools to help you digitize paper business cards for easy organization. Here are five we like most. 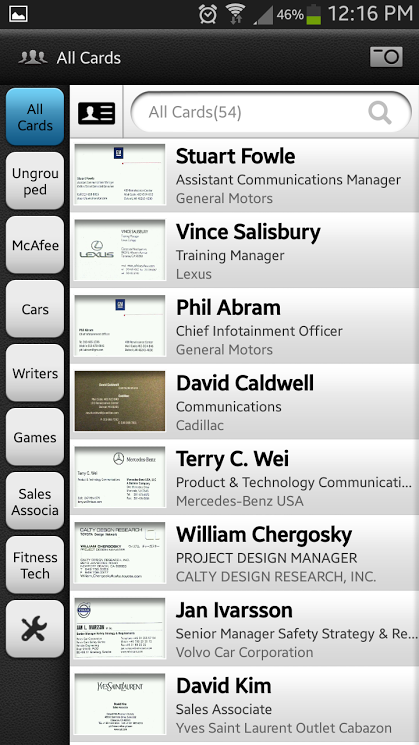 CamCard transcribes business cards to your contact list. CamCard is an app that reads business cards and converts them into digital contacts. Just snap a photo of a card, and the app orients it, reads the text, and transcribes it to your contact list. Contacts are automatically saved to your CamCard digital card file, but you can choose to save them to other accounts, such as email, Facebook, or your phone contact list. CamCard’s OCR works fairly well: It’s good at reading text, but it’s not great at deciphering which text should populate which field in a digital contact file, especially when it’s trying to read a creative layout. For example, CamCard often gets the company name and the person’s title mixed up, because many business cards put the title (not the company) after the person’s name. The app is excellent at transcribing numbers (and putting them in the correct mobile, work, or fax box) and email addresses, however. CamCard also keeps a photo of the card, so if the OCR fails, you have a backup. CamCard isn’t just for collecting others’ cards. You can upload your own card to the database and add augmented reality features, such as links to your work, a headshot, or a video introduction. If another CamCard user scans your card, they’ll get all this information. CamCard is available for Android, iOS, Windows Phone, and BlackBerry. It comes in two iterations—a free, ad-supported version that limits the amount of cards you can scan, and a paid premium version that costs between $10 and $20, depending on the platform. CardMunch makes it easy to connect to your contact’s LinkedIn profile. 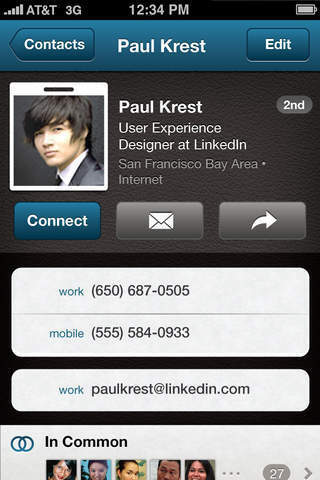 CardMunch is LinkedIn’s business card app (iOS only). Although it’s branded as a card reader, it doesn’t use OCR technology to transcribe cards—it employs actual humans. Just snap a legible photo of the card then sit back and wait for one of CardMunch’s team members to transcribe it and return it in digital form (the process typically takes less than 10 minutes, I’ve found). You’ll get all the contact’s information from the card, as well as from their LinkedIn account if they have one. You can also send them a Linkedin invitation by tapping the convenient “Connect” button. CardMunch also stores the original card photos for reference. CardMunch isn’t for everyone—it’s quite a bit slower than CamCard, and, not surprisingly, it’s heavily LinkedIn focused. You can store digitally scanned contacts to your iOS phonebook, but you can’t export them to your email account or other social networks. But if you want the most accurate transcription of your business cards—and you don’t mind waiting a few minutes—CardMunch delivers. With WorldCard Mobile, you can export your business cards as batch files. If you conduct business internationally, WorldCard Mobile has your back. It can read business cards in 16 different languages, including English, French, German, Italian, Russian, Japanese, and traditional and simplified Chinese. Like CamCard, WorldCard Mobile transcribes photographed business cards into text and populates a digital contact form. WorldCard has its own digital rolodex, but you can also export contacts to your email account and address book. You can also export them as batch files (as an Excel .CSV, for example), or to cloud storage services such as Evernote and Dropbox. WorldCard’s OCR is accurate but it suffers from the same issues as CamCard’s—it struggles to decipher creatively-designed cards. I also found that while it’s very good at reading small, cramped text on cards, it has more difficulty with large, seemingly easy-to-read fonts. WorldCard Mobile—available for Android, iOS, and Windows Phone—is offered in a trial version with extremely limited functionality—you get five cards initially, and one card per week after that. The premium version of WorldCard Mobile costs $3. POPWings creates Near Field Communication (NFC)-enabled business cards that can be shared with anyone who has an NFC-capable device. 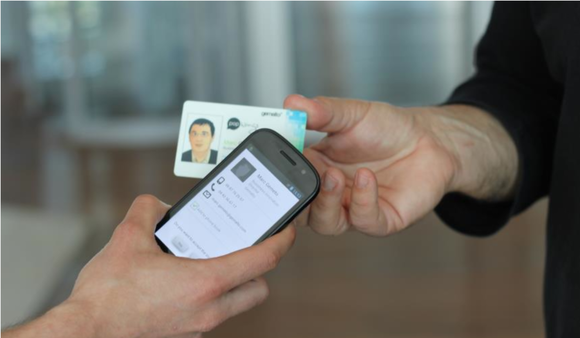 POPWings enables business card sharing between NFC-capable phones. When creating your POPCard on the POPWings site, you can choose from various templates, including a blank one that allows you to upload your own design and enter information to be added to the card’s NFC chip. This includes your name, address, company contact information, and social media accounts. You also have the option of adding a QR code to your POPCard, so people with non-NFC devices (such as iPhones) can use a QR reader to digitally download your info. For $12, including shipping, you get one POPCard in your order. It’s an easy way to transfer your contact information to someone’s device without having to open and fiddle with an app. Chirp transfers data via coded audio and can be configured to share business cards. 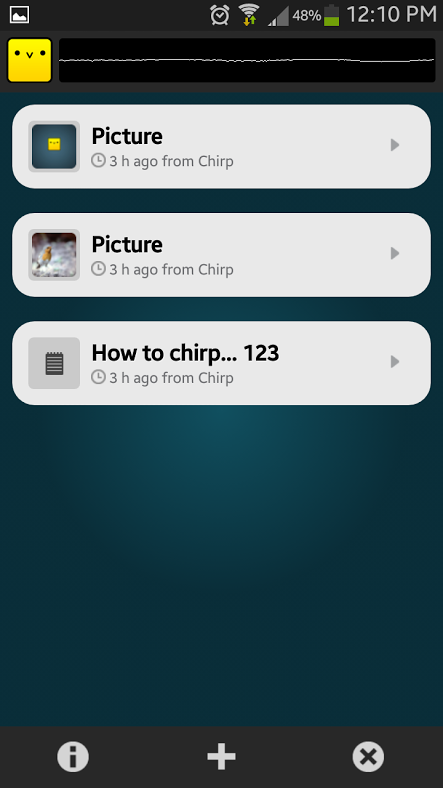 Chirp is an Android and iOS app that transfers photos, notes, or links to other devices by “singing” a special coded song to them. The audio engine on the other device accesses Chirp’s cloud database to decode the sequence of notes into of letters. Chirp’s servers then transmit the data to the receiver. Chirp’s major advantage is that it can transmit to multiple people at once. It can even be transmitted over a loudspeaker to a large audience. This is useful, for example, if you’re giving or attending a press conference and want to send information to a group of people. Chirp’s main drawback is that it’s not really designed as a business tool, so if you want to use it as one, you’ll need to get a little creative and configure it to send a photo of your business card or a link to your LinkedIn account.